Brother Pozz organized a Seder meal for the community. Before the start of the Easter Triduum last week, Brother Pozz organized a Seder meal for the community. 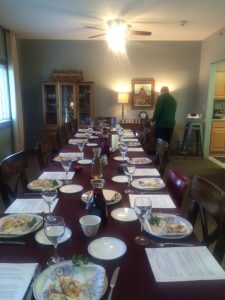 The Seder meal mimicked the traditional Jewish Seder meal to remind us about the Jewish origins of Christianity. The ceremonial part of the meal included traditional Seder items such as bitter herbs, matzah, egg, salt water, and grape juice. The main course of lamb, latkes, and cabbage followed. Last week was also the “Come and See” for the St. Joseph House community. We had three students from Holy Cross College join us in our normal schedule of prayer, work and meals, as well as extra events such as the Seder meal, in order for them to gain a better understanding of what it feels like to live in a house of religious brothers and other men discerning religious life.